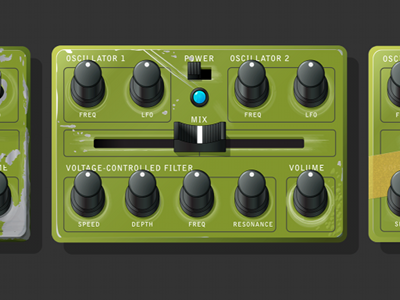 DR-OM and Noisemusick 64-bit updates are now available in the App Store. Thank you for your patience! DR-OM is a virtual synthesizer that simulates the hackable yard sale treasure of the same name. Dozens of DR-OM units have been adapted from a rare, limited science lab function generator that started turning up in flea markets in the 70s. DIY synth enthusiasts discovered the device was easily hackable, and closely-guarded photocopies of the modded schematics have been handed around the community for years. 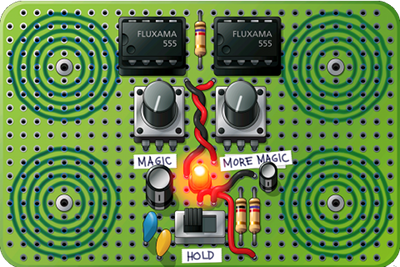 The directions show how to rewire the generator into a nice little synth with two mixable Low Frequency Oscillators and a Voltage-Controlled Filter. The DR-OM box in action. This app is a complete and playable simulation of three different versions of DR-OM boxen that were discovered at a yard sale near Quonset Point along with a folder of photocopied schematics. Each DR-OM unit has its own characteristic sound because of degrading components or bad wiring by the owner. The Speed dial is the most finicky part of the assembly; depending on the box, the dial can cause tuning drifts, random events and gnarly effects. 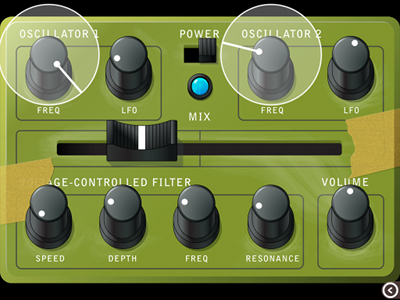 In the seventies, the noise generator was nicknamed "Doctor Om" for the meditation-friendly tones it generates. Others believe the name is an acronym for Drone Ready Oscillator Module or Dual Recirculating Oscillator Module, but no one knows for certain where the name comes from originally. Note: You'll probably want to use more than 2 fingers with DR-OM, so try turning off Multitasking Gestures in your General Settings on your iPad. This is a universal app for iPhone 4+ and the iPad. 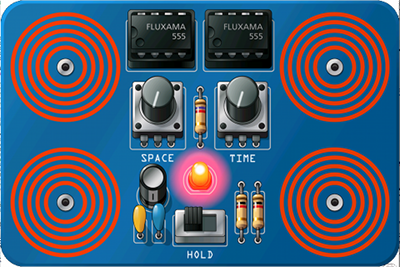 It is produced by the Fluxama Group, purveyors of fine simulated synths like Noisemusick. Sound and video samples may be found on the support web site. 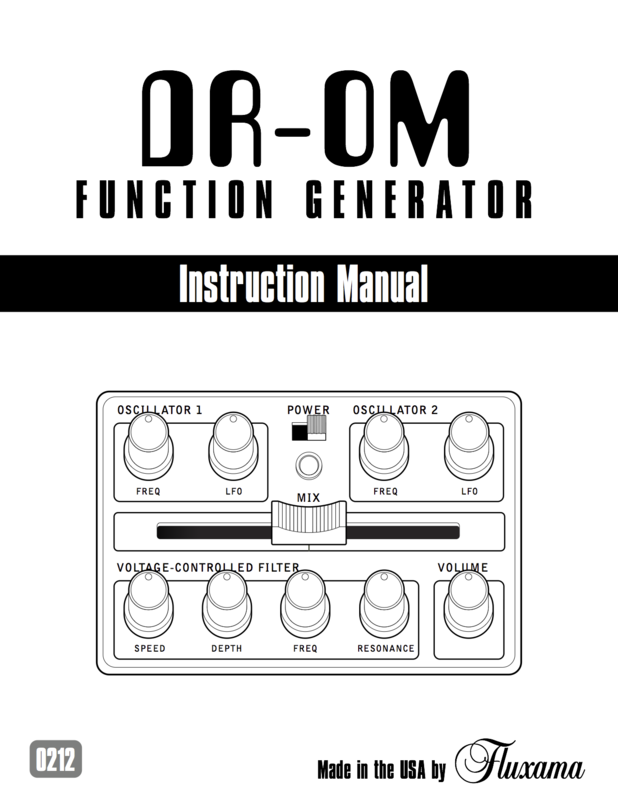 Download the instruction manual to get some indication of what the potentiometers do, and some recommended interesting presets. The manual also has blank preset pages so you can write down your favorite settings. The Noisemusick app is a collection of THREE controllable synthesizers that generate interesting chaotic sounds. 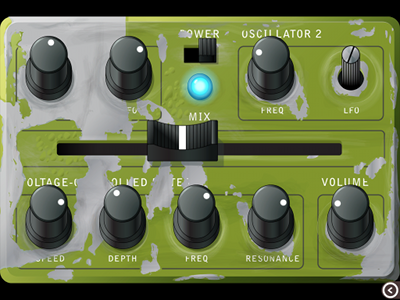 Have fun creating sonic bedlam, exploring weird soundscapes, or use it to GREAT EFFECT in your live performances and recordings. It's squonky electric FUN for the whole family! 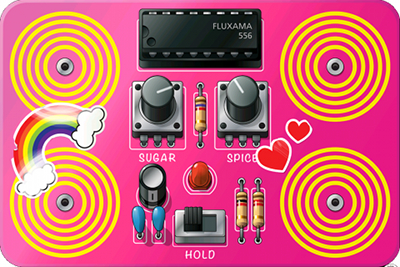 Choose a sound to match your mood: blue, green, or pink! Practice and probe to find interesting interactions of sound! 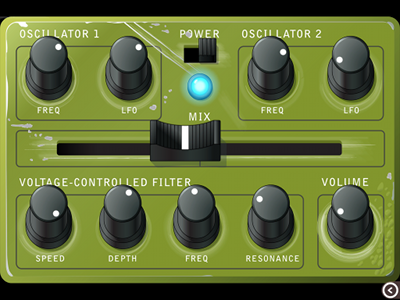 Use it as a raw input to other filters and effects! Run on an iphone or iPad; it's a Universal app! 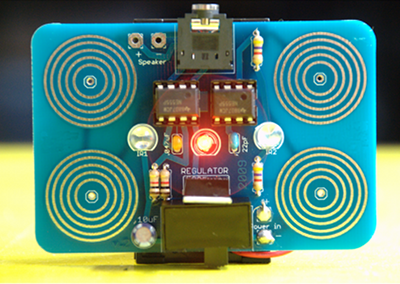 The original circuit boards were inspired by a workshop presented by Jessica Rylan in 2007. The original Noisemusick schematic includes two infrared sensors for additional chaos on the inputs. Since your mobile device doesn't have an infrared input, the circuit has been modified accordingly. 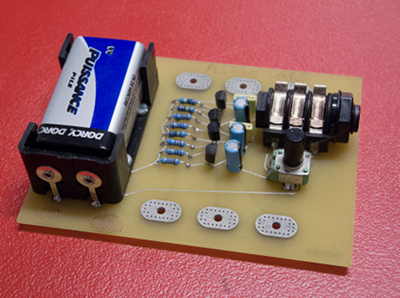 In 2007 the Noisemusick Board was adapted into a PCB and bag of parts that was suitable for the masses. Three varieties exist: the blue commercial kit, a perfboard prototype, and a variant of the commercial board that was branded to appeal to young girls. The later was a complete flop; it turned out that girls preferred the blue boards as much as boys. After a year of poor sales, the remaining 100,000 pink Noisemusick circuit boards were buried in a landfill in New Mexico. 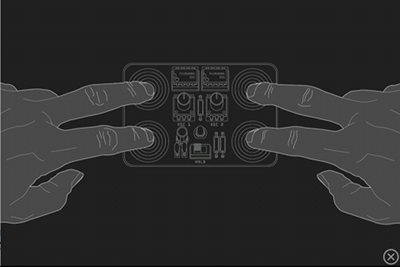 To start making sounds with the Noisemusick app, your body has to complete the circuit between the touch pads. Pressing the pads in different combinations will generate different frequencies and modulations. By lifting a finger or sliding the hold switch you can create rhythmic patterns of noise. Move your fingers to change the resistance between your finger and the pads, which changes the frequency and beating of the tone. On each board the knobs change the quality of the tone in different ways.